Events of this week make it abundantly clear why a group of living beings may want to seek or create an idyllic spot where, like a chastened Candide, they can make their gardens grow in safety and harmony, content to build a community together and free from worry about attack from outside marauders. That is, after all, what peace is. Not the absence of war so much as the absence of imminent or even long-term threat from the jealous, acquisitive, self-righteous, or totalitarian. Particularly unwarranted threat. The rabbits who flee a warren destined to be a building site in Richard Adams’s “Watership Down” seek just that kind of place to establish just that kind of society. The prescient Teiresias of bunnies, Fiver, has nightmares and warns her heroic brother, Hazel, and other rabbits of impending danger. Knowing that Fiver’s premonitions are flawlessly accurate, the rabbits, led by Hazel, act according them and move, fight, and scheme to stave off foes and survive until they can reach a promised nirvana, Watership Down. Adams’s book is popular because his latter-day legend has a strong story with characters that are cute as well as brave and a mythology about sun gods, evil lapine populations, and the mostly dreaded, but sometimes welcome, harbinger of death, the black rabbit of Inlé. Hazel leads his dedicated band on adventures, and they find the obstacles other Utopia-seekers from Moses on have found — enemy armies, enslaved populations, powerful adversaries, including foxes, owls, and cats, and natural barriers that must be negotiated at some peril. They even find more property developers turning more potential warrens into complexes for housing and shopping. Hazel’s exploits have their drama and teach their morals. “Watership Down,” which Adams composed to entertain his daughters on car trips, takes the time-honored elements of storytelling and weaves them into a good, involving tale of danger and triumph. John Hildreth has adapted this tale for the stage with clarity that maintains its accessibility for children. Simpatico Theatre gives Hildreth’s adaptation more depth and more facets by augmenting Hildreth’s script with engaging visual elements, such as colorful projected scenic illustrations by Robert Berry and Patrick Gabrielli, shadow puppetry by Aaron Cromie and Lorna Howley. 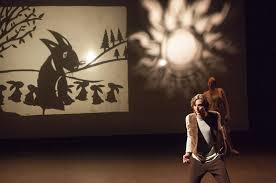 The black rabbit of Inlé and other characters are seen mostly in shadow, giving them iconic form and allowing Simpatico director Allen Radway the chance to convey some circumstances or situations by letting an image be 1,000 words. Simpatico’s “Watership Down” is an impressive technical and artistic achievement. The synchronized timing of several things — live action, animation, shadows — offers visual delight and added excitement that enriches Hildreth’s play. Simpatico’s “Watership Down” is a piece of theater that lovingly fuses multi-media effects with familiar representational acting and standard scene progression. An actor playing Fiver (Cortnée Nicole Love) has her restless nightmare in conventional fashion, writhing timorously in her bed, while we see it in a puppet show that looks like a cartoon. A bearded contractor jumps off his truck, nails a sign that presumably announces a land development project, chuckles as he detonates caps that bring the rabbits out of their warren, and blithely shoots the rabbits as they scurry, to no avail, from danger. This example of one of many that give Simpatico’s “Watership Down” more context and texture. As images repeat, the story becomes deeper. The next time we see the contractor jump from a truck, we don’t have to see any more. His image alone tells us what’s going to happen and, in terms of Adams’s story, creates an urgency that would be difficult to muster if so much wasn’t going on at once. The good news all is coordinated so that one part doesn’t detract or distract from another. The images and elements come together to form a whole that benefits Adams’s plot and Hildreth’s adaptation of it. “Watership Down” needs this creative push. While much happens to Hazel and his valiant peace-seekers, “Watership’s'” plot is formulaic and reminiscent of other legends. There’s excitement and adventure, but it’s of a rather simplistic and predictable sort. The story needs something to give it a boost, to make Adams’s work as compelling as it is diverting. The visual effects provide that. 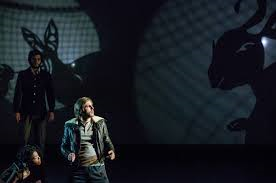 Radway, Cromie, Howley, Berry, Gabrielli, and lighting designer Andrew Cowles give Simpatico audience a simultaneous show that illustrates and casts pictorial reality to the challenges Adams’s rabbits are facing. “Watership Down” requires a lot of imagination to envision the below-ground existence the rabbits describe, the kinds of enemies they encounter, and even the squirrel king’s lettuce patch. Radway and his co-creators do that work for us and manage it splendidly, so dramatic sequences show as well as tell, and we are aware of all the rabbits might endure on their way to their desired Utopian destiny. Cromie and Howley have particular fun with various animals that populate a farmyard where rabbits Hazel and company need to populate their warren are penned and treated as both pets and a possible next meal. The cat, dog, mouse, and people of these sequences add to their fun and to your sense of Hazel’s danger as he encounters natural predators, especially that eager cat. Vividly painted scenes are juxtaposed with shadow puppet shows and live action that takes place on both sides (in front of and behind) of a screen, so you always have the sense Simpatico’s “Watership Down” is moving forward with no lulls. Our sojourn with Hazel and his band is more amusing than exciting, so the extra layers of things to see and appreciate enhance “Watership Down” in exponential ways. You may never find yourself engrossed with the story or more than mildly interested in the outcome of a struggle between Hazel’s forces and some foe, but you’ll always be engaged in how Radway and company are presenting Hildreth’s play and enjoy the story more because of it. “Watership Down” is among the legends that have been written during the last 50 years. Richard Adams makes anthropomorphic animals his characters, the rabbits being the protagonists and primary adversaries in the story. Living in a fairly peaceful warren, Fiver, named so because she was the fifth of a five-kitten litter and is therefore its runt, has visions that are known to come true. She shares them with her brother, Hazel, who has the wisdom and bravery to know how to respond to what Fiver tells him. When she has her nightmare about the contractor, she pleads with Hazel to gather others and leave their doomed warren at once. He, sensing Fiver’s concern and knowing her record for accuracy, takes her warning to heart and organizes an abandonment of the warren, which means getting past a fierce brand of rabbit police called Owlsla, one member of which is Bigwig, whose job is to protect rabbits by keeping them within their warren. Bigwig, though he works hard to thwart Hazel’s exit to uncharted pastures, eventually joins the fleeing band, adding some strength and defensive power to their number. Holly, another who tried to block Hazel and Fiver from running for safety, later comes to report that everything Fiver said occurred, and the old warren was destroyed. Hazel and his followers meet all kinds of other rabbits as they seek Fiver’s envisioned refuge, Watership Down. One group seems cultured and haughty to the point you can’t be sure whether they’re friends or are using Hazel’s crew for some nefarious purpose. Another group lives in dismal regimentation in a warren that is as much a prison as it is a home. Meanwhile, we hear of other, more ancient rabbit population that lived in the era of a beloved but mischievous rabbit named El-ahraihrah, an obvious direct ancestor and role model for Hazel. The rabbits must fight or use cunning to get out of all kinds of scrapes and to solve problems. Some of the rabbits have special talents. Blueberry, for one, has an engineer’s sense of how things work and can figure out solutions to situations like getting Bigwig loose from a snare trap or figuring out how to unlatch the gate that holds the penned rabbits on a farm. Another, Silver, is fearless and speedy and can help lure predators as a decoy when necessary. The Simpatico production is full of props, one of the most impressive being a rowboat that can get Hazel’s rabbits to safety in an intense situation, probably the most intense in Hildreth’s play. “Watership Down” is a collaborative effort between Simpatico and Drexel University’s Mandell Professionals in Residence Project, through which Drexel students benefit from working with professionals in a given field, in this case, theater. With the exception of Sam Sherburne as an ironic and funny Bigwig and Edward Snyder as two memorable characters, especially the defensive bird, Kehaar, Radway has directed student actors in this production, most of them members of the theater club but majoring, by necessity, in other subjects. Radway has done a wonderful job with them. Performers with large roles acquit themselves nicely, several with distinction. Sherburne and Snyder, meanwhile, are aces who not only set their castmates a fine example as acting pros but who entertain grandly and without self-consciousness. Snyder’s Kehaar, with his slight German accent and running commentary on the cycle of life, becomes particularly loveable. You look forward to his return when he’s not on stage. Alex McCormick captures the heroism in both of his major roles, the practical leader, Hazel, and the vaunted hero of the rabbit world, El-ahraihrah. McCormick is physical as well as sincere in his portrayal of these two leads. He conveys Hazel’s leadership on first sight and has a great time as the wily El-ahraihrah. “Watership Down” needs a strong, responsible figure in its lead. We need to root for Hazel, even when he does something reckless or isn’t as sure as we’d like him to be about overall strategy. Hazel is a plugger. He will persist in spite of obstacles, and McCormick finds his leaderlike way in him. He can convey the rugged resolve of Hazel while showing the rabbit’s softer, more everyday side. Cortnée Nicole Love is never self-conscious and portrays Fiver in a lively, direct manner. Sam Sherburne, the hair on his temples combed up to form an ostentatious crown of sorts, is marvelous at Bigwig. Sherburne measures his reading perfectly in a way that guarantees children will get all that his Bigwig represents. Sherburne goes about making sure Bigwig is abreast of all that transpires in the rabbit world and prepared to act on any scheme necessary for the rabbits to survive. He endows Bigwig with the wit and restraints of the gentle giant that can soothe or wreak havoc at a second’s notice. Edward Snyder is just plain funny at Kehaar, who has lots of good lines that Snyder soars in delivering. He makes Kehaar hilarious while keeping his Cowslip a bit mysterious and ominous. With a loopy Sid Caeser-ish German accent, Kehaar is fun to hear as he describes the wider world the rabbits can barely fathom and entertaining when she’s spying for Hazel or keeping lethal enemies away from our heroes. Hildreth has a tendency to delay action as characters describe what they need or want in length. I’m sure he’s done this for the benefit of children, but sometimes you want a character to run or take some action while they’re still listening to another character blather on. Kehaar is the one character who acts fast and you wouldn’t mind listening to because he’s so humorous. Jacob Merinar is engaging as Dandelion, who frequently serves as the narrator for “Watership Down.” Lithe and expressive, Merinar invites you into the story. Joe Canuso, not to be confused with Theatre Exile’s founding producer, is excellent as Silver, a rabbit that is proud of his speed and ready to risk anything to get Hazel and his group to safety. Canuso endows Silver with lots of energy that enlivens Radway’s production in general. Joy Weir is good at showing Blackberry, the technical savant, coming to conclusions about what things are and how they work. Laura Allan shows nobility and gives “Watership” texture as the smart and cunning Hyzenthlay. David Blatt conveys the evil in the dictatorial General Woundwort. Thomas Benjamin can be commanding or empathetic as the death-announcing black rabbit of Inlé. Sophie Hirsh and Marly Logue are fine in their roles as Clover and Strawberry. The technical work involved in “Watership Down” is admirable. So is the preparation. To study how rabbits move and react, the cast spent a day with the folks at For Bunny Sake Rabbit Rescue. The session paid off. Without going overboard, the cast nicely choreographs its motions and lapine ways. Jillian Rose Keys does a fine job with costumes. Andrew J. Cowles lighting add to the mood of the piece and allows the scenic artists and puppeteers to have their work register so clearly. Josh Totora’s music is like a movie score, often commenting on what is happening in a scene. Watching “Watership Down” makes me wonder why audience after audience can easily see the danger facing vulnerable or decent characters and root for those characters to prevail, by war or skirmish if necessary, but back away when genuine peril threatens humankind, failing often to take action when it can be fast and minimal to wait until matters escalate and full war becomes a major issue. Sometimes I wish the courage and resolve seen in fiction would translate to decisive action in real life. “Watership Down,” produced by Simpatico Theatre Group and Drexel Mandell Professionals in Residence, runs through Sunday, November 22, at the Mandell Theater, 3141 Chestnut Streets, in Philadelphia. Showtimes are 8 p.m. Wednesday through Saturday and 2 p.m. Sunday. 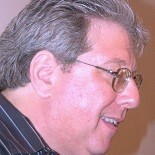 Tickets are $25 and can be obtained by calling 267-437-7529 or by visiting www.simpaticotheatre.org. This entry was posted on November 15, 2015 by nzoren in Theater Reviews and tagged Aaron Cromie, Alex McCormick, Allen Radway, Cortnee Nicole Love, David Blatt, Drexel Mandell Professionals in Residence, Drexel University, Edward Snyder, Jacob Merinar, Joe Canuso, John Hildreth, Josh Totora, Joy Weir, Laura Allan, Lorna Howley, Mandell Theater, Marly Logue, Patrick Gabrielli, Richard Adams, Robert Berry, Sam Sherburne, Simpatico Theatre, Sophie Hirsh, Thomas Benjamin, Watership Down.